The popularity of the iPhone and iPad mean that most people who use iTunes have iOS devices. But we shouldn’t forget that there are still millions with non-iOS iPods, such as the classic, nano, and shuffle. In this week’s column, I address a couple of questions sent in by readers who use these “legacy” devices. I also look at questions about gaps not playing between songs, and devices authorized to download iTunes content. I’ve seen this happen on one of my iOS devices. 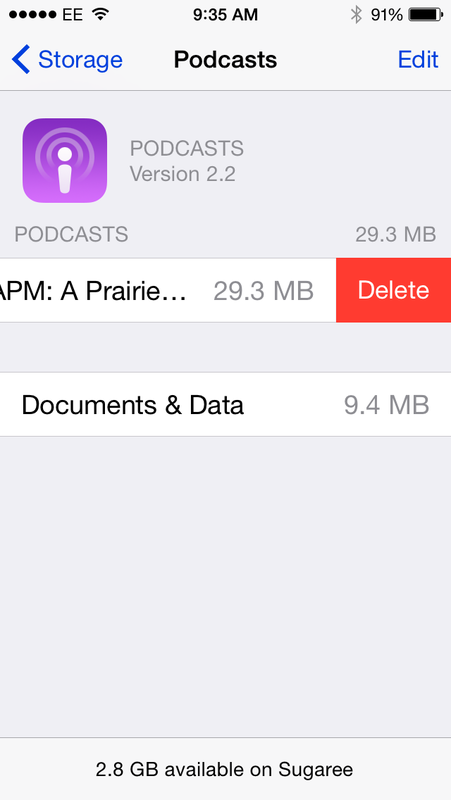 On iOS, you can delete some items, such as podcasts, from the Settings app. To do this, go to Settings > General > Usage > Manage Storage, and then tap Podcasts. If the “phantom” podcast shows up there, you can swipe left to delete it. Deleting a phantom podcast from the Settings app on iOS devices. However, there is no such option for the iPod classic, or other non-iOS devices such as the iPod nano or iPod shuffle. What you can try is this. Connect the iPod classic to your Mac, then select the device in iTunes. In the Options section of the Summary screen, check Manually manage music and videos. Click Apply at the bottom of the window. Next, look at the On My Device section of this screen, in the sidebar at the left. Click Podcasts, and see if the phantom podcast is there. If it is, select it and delete it. You can then uncheck Manually manage music and videos and click Apply to set the device to sync normally. If this doesn’t work, the only option I can think of is to restore the device, which deletes all its content. Sync it after that to put all your media back on the iPod. Q: How do I delete audiobooks from my iPod nano and MacBook Pro? If you’re syncing all your audiobooks to your iPod nano, then deleting any of them from your MacBook Pro will remove them from the iPod the next time you sync. However, you need to know that, unlike music or videos, you cannot re-download audiobooks purchased from the iTunes Store. (If your audiobooks are from Audible, then you can download them again, so don’t worry.) If you think you may want to listen to any of your audiobooks again in the future, you should back them up to an external hard drive or other device. As for deleting them from the Mac Pro, that’s simple. Select an audiobook in iTunes, and then press the Delete key. iTunes will ask if you’re sure you want to delete it. If you click Delete Audiobook, another dialog will ask if you want to move it to the Trash, or keep it on your Mac. It seems like you want to get rid of them completely, so click Move to Trash. The file will be removed from your iTunes library, and will be placed in the Trash. The next time you sync your iPod, that audiobook will be removed. Q: I’m from the days of actually playing records on a Victrola. I like there to be a gap between songs, and I can’t find anywhere in iTunes that lets me add seconds of time between songs. I have a few songs from albums purchased from iTunes where the next song begins even before the current song ends. Any ideas on how to solve this dilemma? It’s fairly common for songs to segue into each other; the classic example is Pink Floyd’s Dark Side of the Moon, where each side of the original LP played without interruption. This is also the case in a lot of classical music (especially opera), and live recordings. 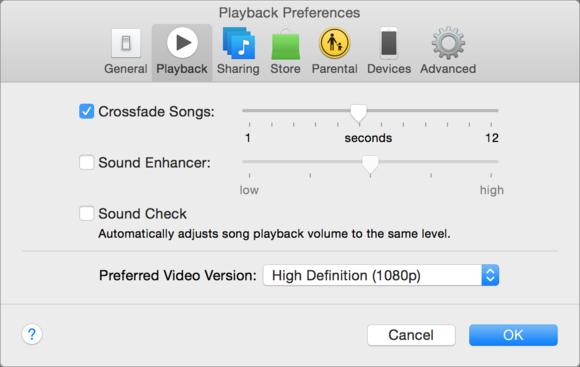 However, what you describe suggests that you may have inadvertently activated a setting called Crossfade, which tells iTunes to start playing one song before another has finished. You can check this by choosing iTunes > Preferences, and then clicking Playback. 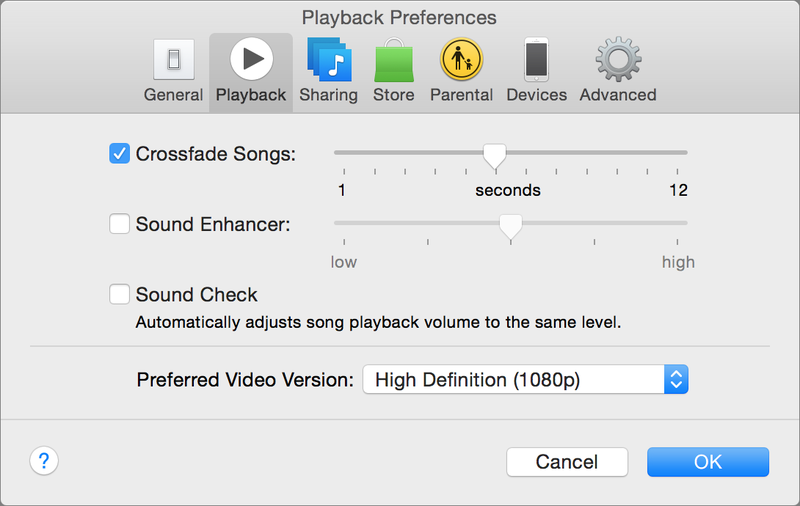 If the Crossfade setting is activated, iTunes overlaps the beginnings and ends of songs. In this screenshot, each song will start about 6 seconds before the previous one ends. If this is indeed the case, just uncheck that option. Most songs have a bit of silence at the beginning and end, and you should hear a few seconds of silence between tracks. Q: In iTunes, under Account Information > iTunes in the Cloud > Manage Devices, two devices are listed in the section that says These computers and devices are associated with your Apple ID and can download your purchases from iTunes in the Cloud. How do I add my new iPhone to that list? All you need to do is download something on your new iPhone, and it will automatically be added to that list. This could be a previous purchase, or a new one; something you bought, or a free app or song. You don’t need to add your iPhone before being able to use it.